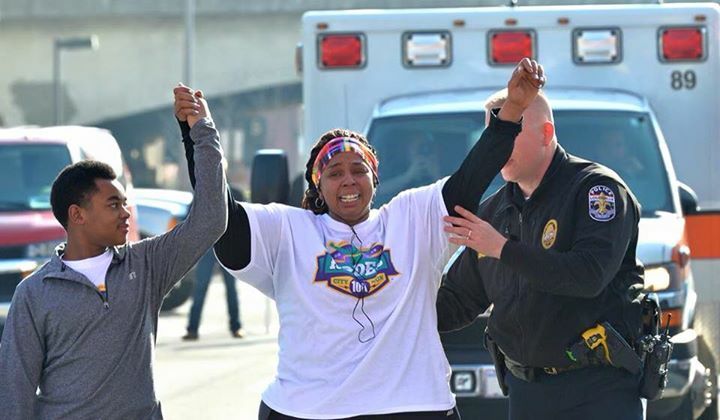 A (white) Louisville police lieutenant took the hand of a (black) racer and helped her across the finish line of a race in Kentucky. This is evidence that Americans down on Main Street are still pretty good peeps. If you emerged recently from the cave you’d been living in for 50 years and tuned in to TV and others sources of news and current events, you’d be so overwhelmed by all the violence and racial tension and ugliness–(and that’s just the behavior in Congress)–that you’d probably beat a hasty back to the security of your cave. Despite all the noise of the loud clowns in the media and politics, most Americans are out there in their communities living normal lives and, in fact, being quite neighborly. I submit to you as evidence this story from Louisville, where a kindly cop helped a most determined woman achieve her goal in a race. At bottom, Americans are still just good people. 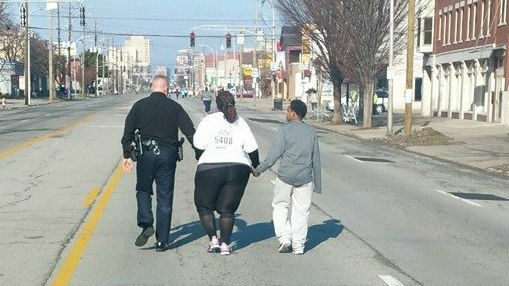 LOUISVILLE, KY (WAVE) – A powerful photo from the Rodes City Run is making its way around Louisville social networks. Asia Ford trained for the race for months. Approaching mile five, she began to have difficulty breathing. As she struggled step by step, she felt a hand grab her hand. Lt. Aubrey Gregory of the Louisville Metro Police Department had been looking out for Asia from afar. For Asia, quitting was not an option. She has lost 217 pounds in her journey to healthier life, and she hopes to inspire her three children. Ford said Lt. Gregory shared stories of his mother and her struggle with diabetes. Step after step, Ford realized Lt. Gregory had kept her mind off the pain – and on the goal. Hand in hand, Asia, Lt. Gregory and Asia’s son Terrance crossed the finish line. Asia’s son Terrance calls her a hero. “Looking at her and how she used to be, it’s inspirational and makes me push harder to do the things I want to do in life,” said Terrance. He also has a new perspective, on the men and women who wear a police uniform. “You know with all the stuff that’s going on with police it’s just nice to know there are nice people out there,” he said. As for Lt. Gregory, he said moments like the one he shared with Asia and her son are the reason he wears his badge every day. He hopes the photo is a reminder of this reason. Asia said Lt. Gregory’s helping hand, is what helped her continue the race. “I just want to thank you. you are my angel. I could have given up and you didn’t allow it. You are my inspiration,” she said.